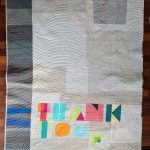 I’m out of order on updating about finishes this year, but wanted to deliver this quilt before publishing. Then, of course, another month or two flew by before I remembered to post. 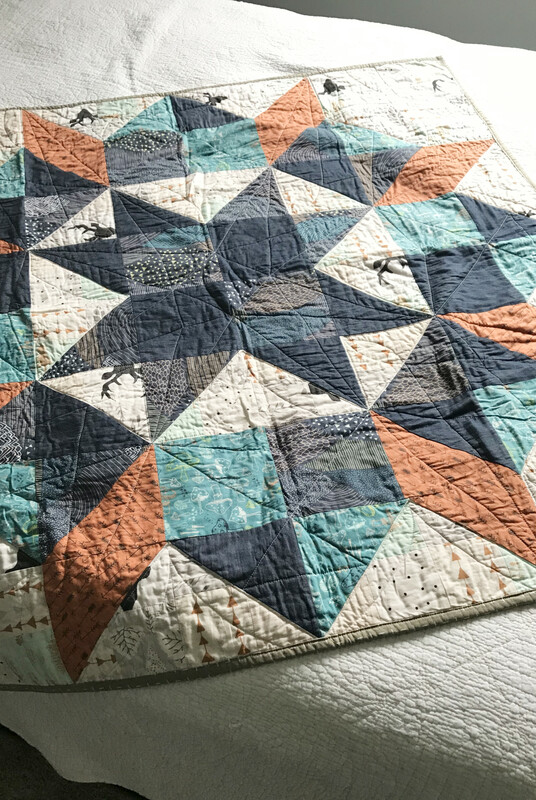 I finished this about a week before Welcome, having completed the top in May, then finally quilting it once I’d moved to GA.
I’ve admired all of the Swoon quilts I’ve seen around the ‘net for some time, but it was never a pattern I wanted to make for myself. However, a blown up Swoon star seemed just the thing for my friend’s newborn daughter. 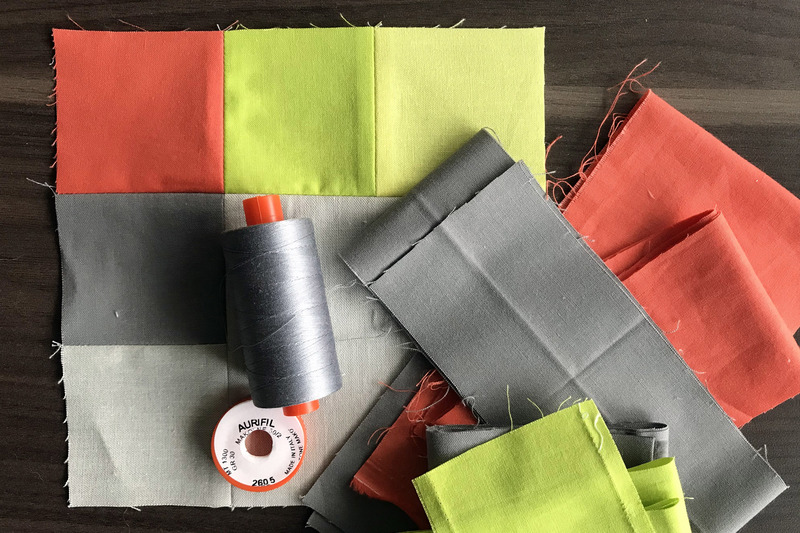 I wanted to use fabrics from stash—mostly so that I could get started right away when motivation came back after a few months of no sewing. 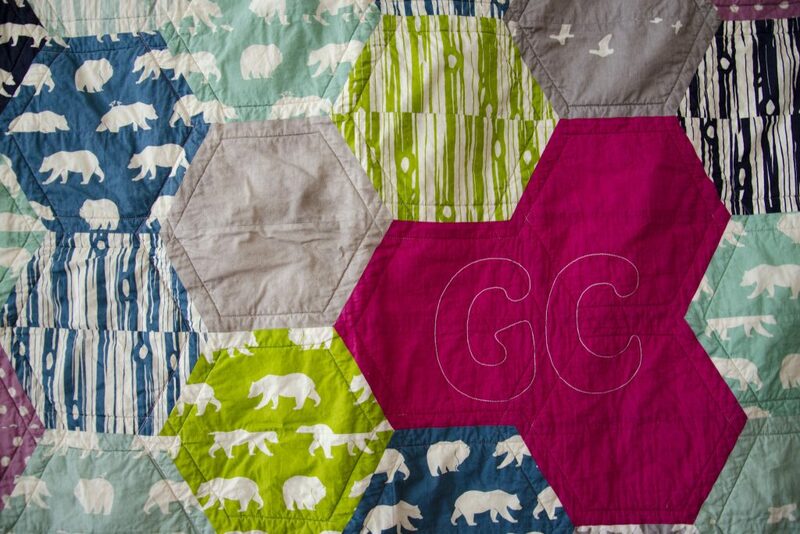 A fat quarter bundle of Hello Bear for Art Gallery Fabrics seemed perfect for a sweet baby girl named Wilder. Once I planned out the color placement, I realized I didn’t have quite enough dark fabric to carry off the design, so I added in a chambray to round it out. I wasn’t a fan of how the color layout worked if I used a single light print in blocks, so I pieced the background fabrics into four patches. However, I made the choice to not have show-perfect half-square triangles—I didn’t have enough of the darks and mediums to pull it off. Turning four patch blocks into HSTs means that the center point gets lost in the HST seam, and the pieces don’t match up perfectly when set side-by-side. 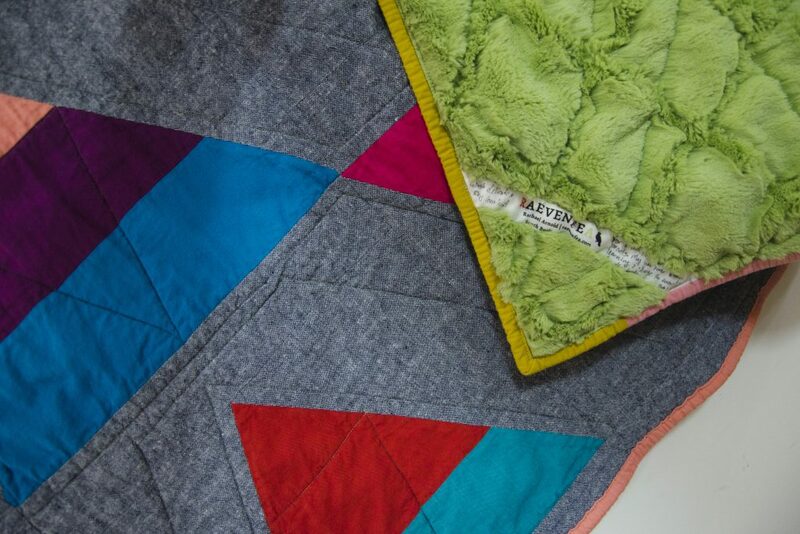 To make that look a little more intentional, the outer background blocks use slightly different sized pieces in the four patches so seams don’t match up everywhere (accomplished by making them a bit oversized, then cutting chunks off one side or the other). 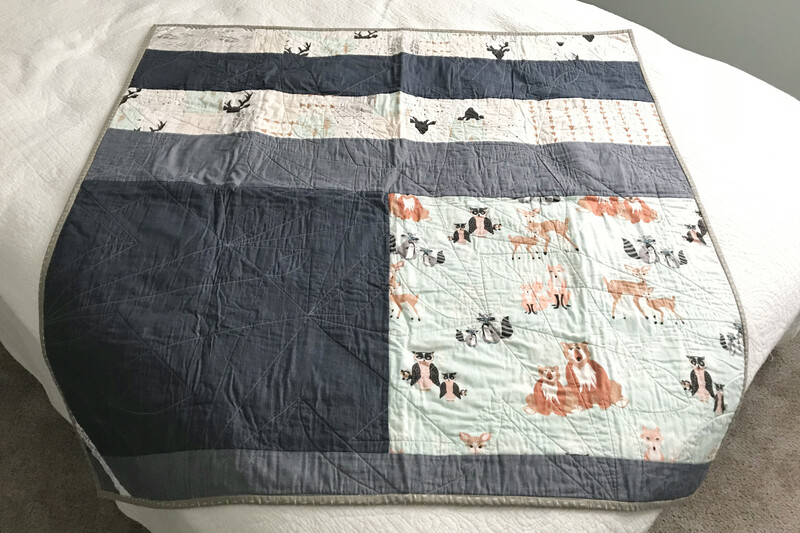 The back is pieced from chambray, a fat quarter from the stack that was too cute to chop up, and with scrap pieces and spare blocks left after constructing the front. There’s a low-loft cotton batting in between (a scrap, so I’m not positive about brand). Because I was quilting on my new travel machine, I had to stick with quilting motifs I could do with a walking foot. I kept it somewhat simple, choosing what to do as I got to each new section. It’s mostly straight lines and slight curves going point-to-point. As with the Welcome quilt, I had a little puckering due to a new basting setup and new machine. But, it washed up nicely and I’m sure Miss Wilder won’t care too much if her siblings and their attachments to quilts are any indication. When I dropped off my welcome blanket donation at MODA, I stopped in to see the current exhibit, “Making Change: The Art and Craft of Activism”. 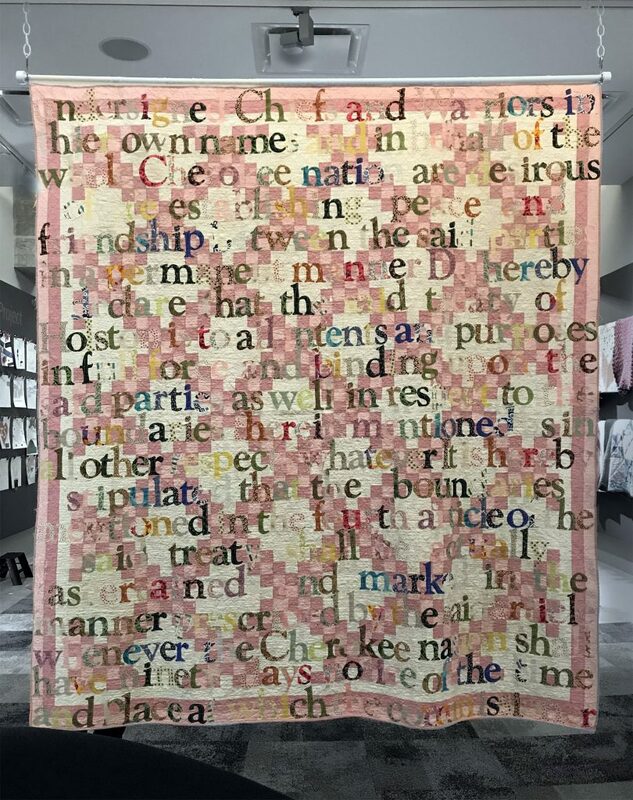 I’d heard about the exhibit in a post by Chawne Kimber, as her quilt “The One for Eric G” is in the show—in fact, it’s one of the first artworks you see. It was great to see her work up close (those incredibly consistent hand stitches! that precision piecing! 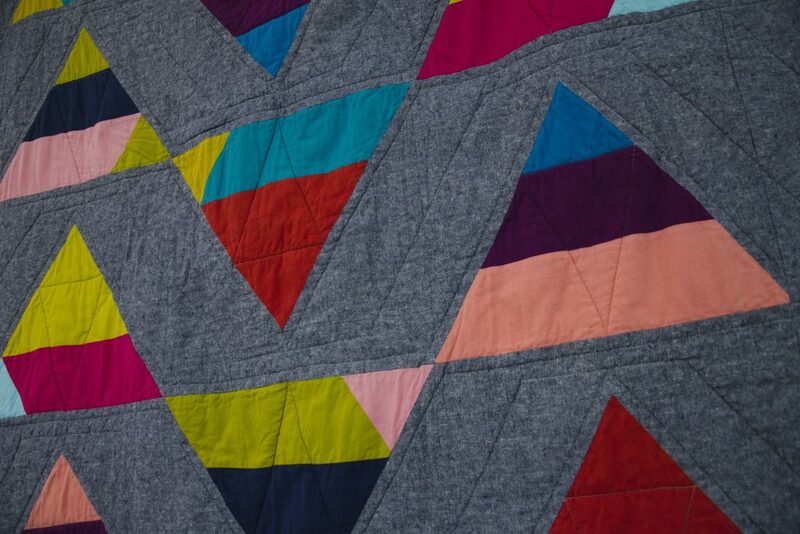 the subtle movement and inclusion of color that just isn’t apparent in an online photo of the full quilt! 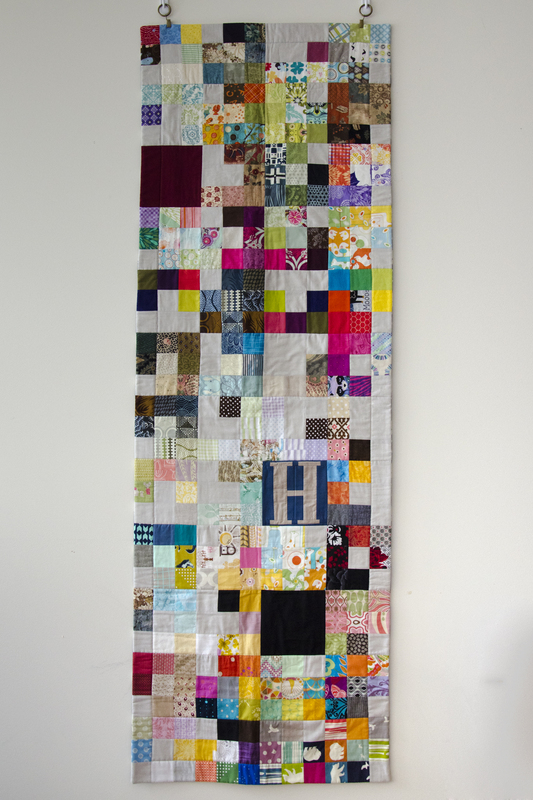 ), but my attention was grabbed by two other quilts in the show, and I kept walking back to them to study in depth. 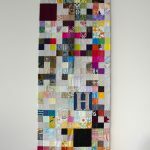 From afar, the two quilts look incredibly different, but it was their commonalities that captured my attention, and have kept my mind coming back to them even now, a week later. 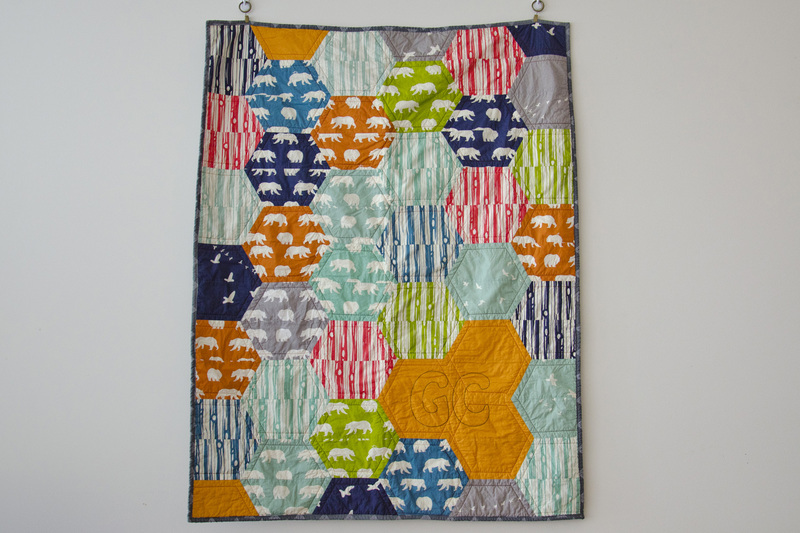 The main commonality between the two is their use of antique quilts as a base for appliqué. And while they both had a message about war, destruction, and death, it wasn’t their political message that caused a visceral reaction for me. That reaction was caused by the potential destruction to the original quilts. “Treaty With the Cherokee 1794,” Gina Adams, 2015. 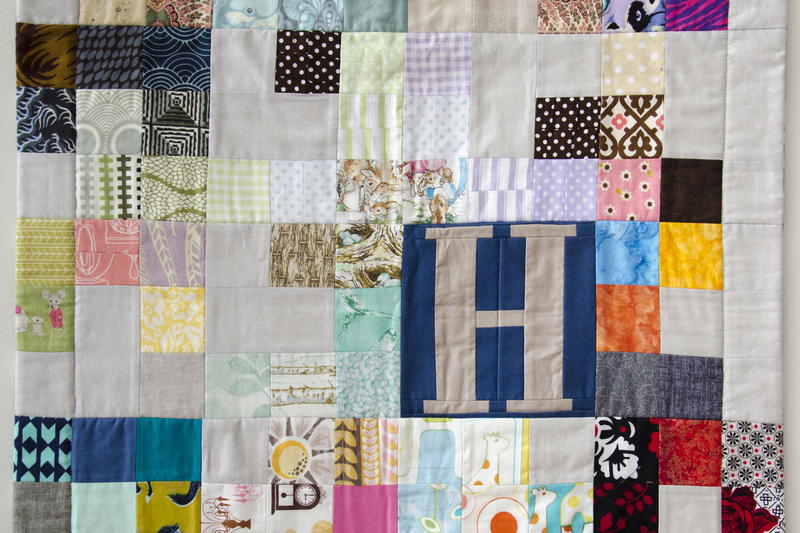 Antique quilt, hand cut calico letters, cotton thread. Photo by Rachael Arnold. First was “Treaty With the Cherokee 1794” by Gina Adams, which is double-sided. I saw the front of the piece first, which is the back of the original quilt, so it wasn’t immediately obvious what the base medium was. 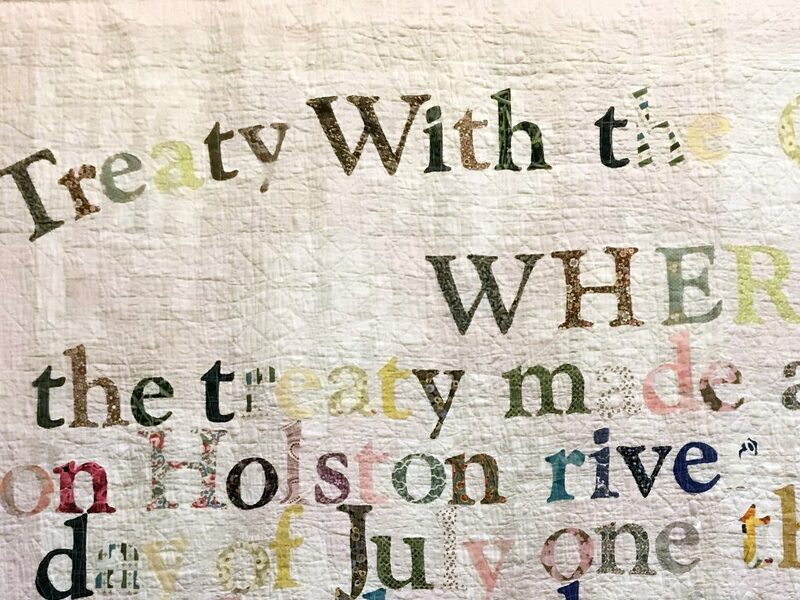 In this artwork, the artist has appliquéd the words of a treaty onto an Irish Chain quilt with a solid backing fabric. On the spectrum of destroying the original quilt, this one is somewhat minimal. I don’t know whether Adams used an adhesive on her letters, but in theory, the stitching and appliqué pieces could be removed and the quilt would be returned to its unaltered format. If anything, the stitching might even have stabilized the quilt, as you can see a few places where there are holes through all the layers. My mind plays more with the “what ifs” on this on. What if Adams had used a quilt that was actually contemporary to the treaty instead of one that likely dates to the 1860s at the earliest (there are far fewer extant quilts from the 18th century)? 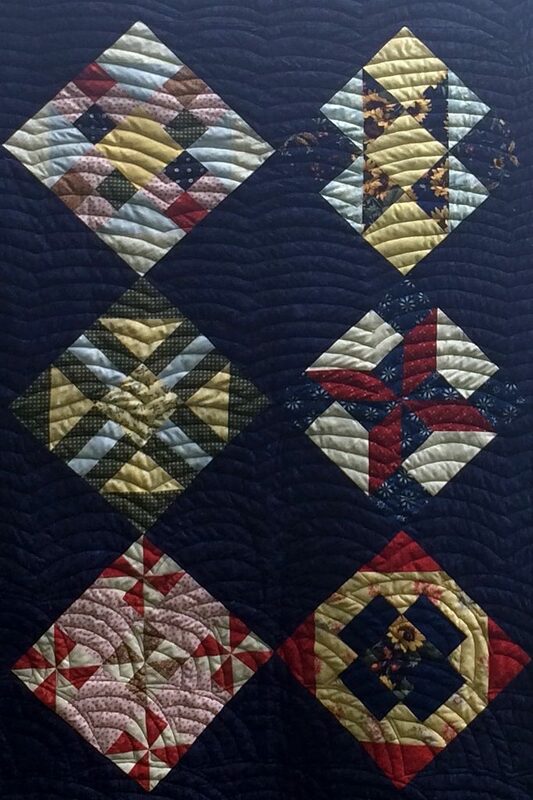 What if she had used a quilt that was a less common pattern than an Irish Chain, used a pattern without as much representation in various antique collections? 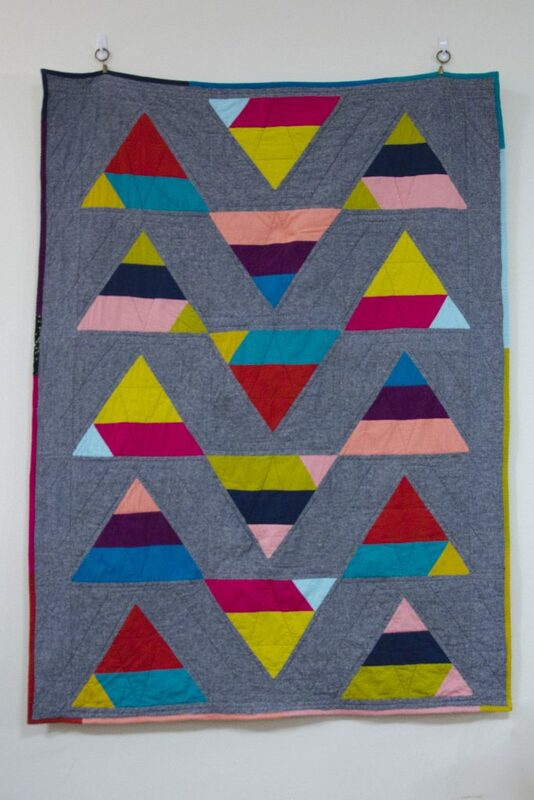 Would those cause more of a reaction on my part, making me mourn the loss of the original quilt? On the flip side, I think the piece would be even more impactful if Adams had used a quilt that was more befitting the style and tastes of 18th century than a design so timeless that it could have been made any time from the early-mid 19th century to now. What if she was able to use something more closely resembling a blanket that could have been traded between the parties involved in the treaty negotiations? Detail of “Treaty With the Cherokee 1794,” Gina Adams, 2015. Antique quilt, hand cut calico letters, cotton thread. Photo by Rachael Arnold. So I think that’s the core of it—I don’t mourn the loss of an antique quilt, in this case, but the opportunities left unaddressed. “Dresden,” Maggy Rozycki Hiltner, 2016. Over-dyed cotton quilt, linen, cotton. Photo by Rachael Arnold. “Dresden” by Maggy Rozycki Hiltner is my favorite piece in the exhibit from a graphic standpoint. But, it’s also the one that leaves me most torn based on the execution. The artist took a gifted Dresden Plate quilt (likely circa 1920-30), overdyed it with black dye, then appliquéd skeletal figures over the top. From afar, you don’t see the textures of the underlying dresden plate blocks. It’s only once you are close that you begin to see the variations in blacks as piecing, coupled with wear and tear on the antique quilt. I wondered if the woman who gifted Hiltner with the quilt knew its eventual fate, and if not, would she have done so with that knowledge? 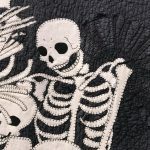 There’s no going back from the overdying process—the quilt as it once was can never again exist. Detail of “Dresden,” Maggy Rozycki Hiltner, 2016. Over-dyed cotton quilt, linen, cotton. Photo by Rachael Arnold. In contrast, I saw some of Kara Walker’s lithographs a few weeks ago at the High Museum of Art. 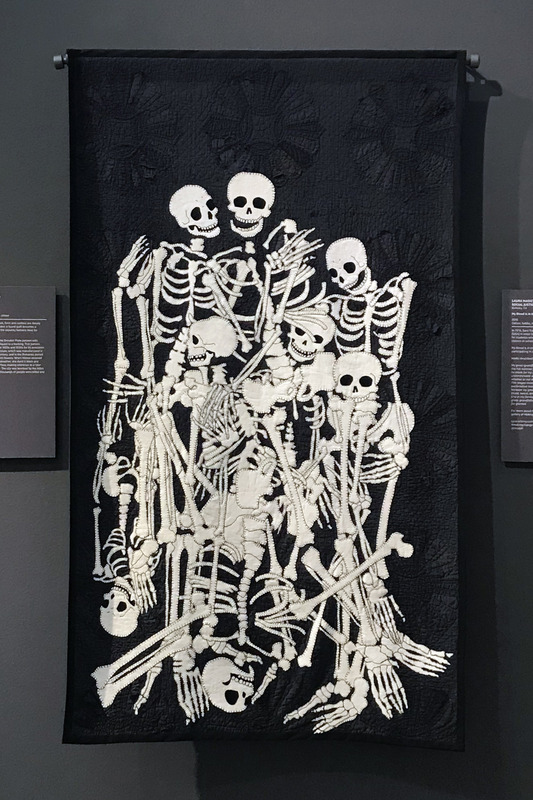 Her works are also palimpsest-type pieces: reproduction lithographs from the American Civil War era coupled with cut paper silhouettes simultaneously enhancing, obscuring, and contextualizing a broader story to the original work. These works didn’t invoke the same visceral reaction as the two quilts, especially “Dresden”. Although it wasn’t 100% clear to me at the time, the lithographs are reproductions, not originals (although I made assumptions based on lack of discoloring and print quality). Perhaps it’s that paper prints are easily reproducible—even if you destroy one, there are surely other copies floating around. Perhaps it’s my lack of personal connection to the craft. Perhaps it was my subconscious making the call that the lithographs were clearly reproductions before my research verified it. 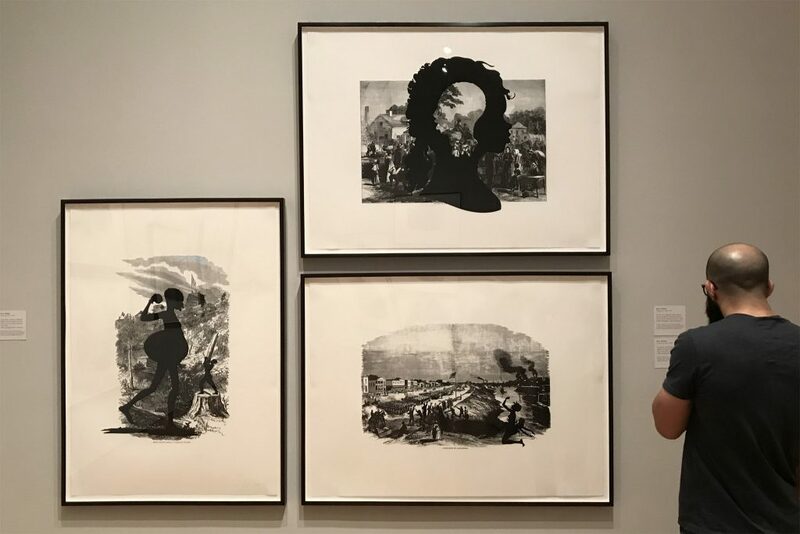 Three works from the Harper’s Pictorial History of the Civil War (Annotated) series, Kara Walker, 2005. Offset lithograph with screenprint. Photo by Rachael Arnold. Collectors and curators can’t save every piece of art or craft. Part of collecting is making decisions on what to purge from a collection if you’ve procured a similar piece that is a better representation of the collection’s aim. 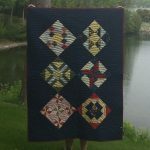 In that mindset, not every antique quilt is worth saving, and given the prolific creation of both Irish Chain and Dresden Plate quilts, it’s unlikely that either of these originals was collection-worthy as is. Yet, could the same message have been achieved with a reproduction created specifically for the project, like with Walker’s lithographs? 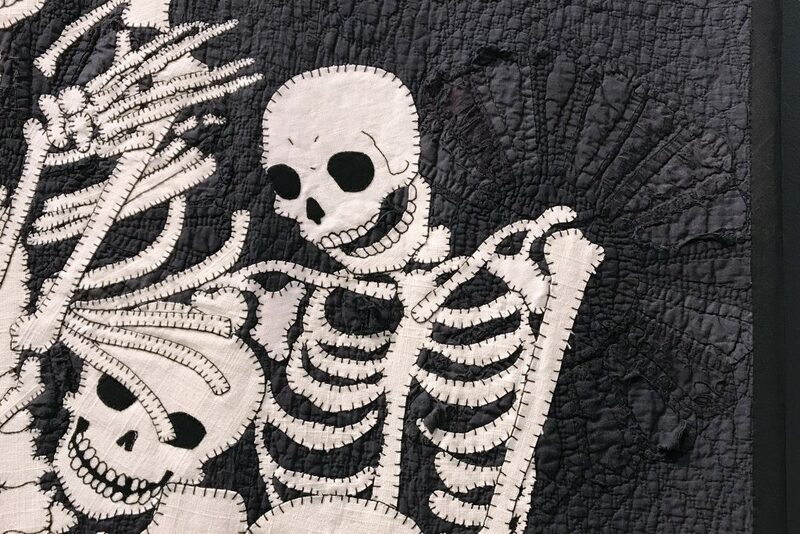 In the end, this is why quilts are art. We ask these questions. We search for meaning. We may read more meaning into a piece than the artist intended. And to answer my own question, maybe it’s okay that both of these pieces used antique quilts. In “Treaty,” an otherwise non-special quilt is elevated in a way that neither fully obscures the original workmanship, and potentially preserves the stability of it. In “Dresden,” the dye obscures the one attribute of the quilt that might have set it apart from others—the printed fabric—but that destruction in itself echoes the destruction of countless other quilts buried by the rubble of Dresden’s bombing. And maybe you’ll answer that question differently, or have never asked it at all. This is the last quilt I finished in 2017. 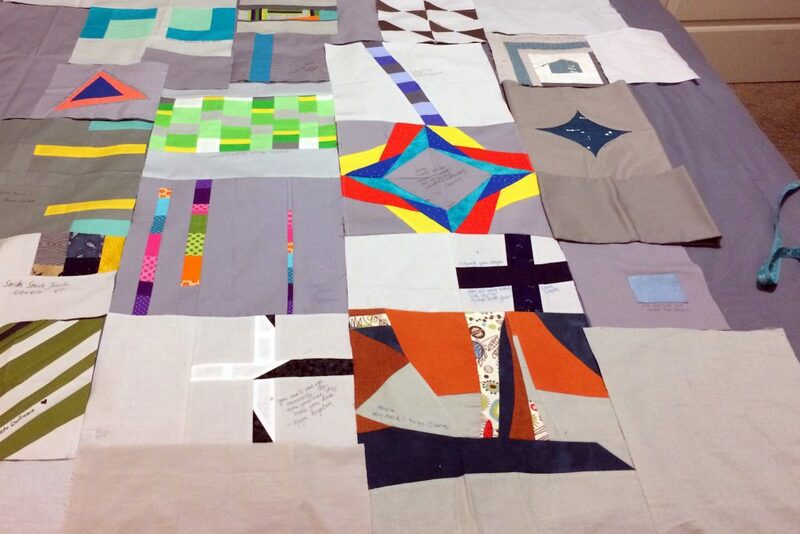 Although I didn’t make most of the blocks, I’m counting it as one of “my” quilts for record-keeping purposes, since I came up with the project, managed the block collection, and put it all together. I also quilted it and bound it by hand (the first in a long time). Of course, I couldn’t have done it without all the work my guild members put into the blocks—I’m so thankful for what they gave me to work with! My local MQG is continuing to grow and evolve, and this year we had our first changeover in presidents. 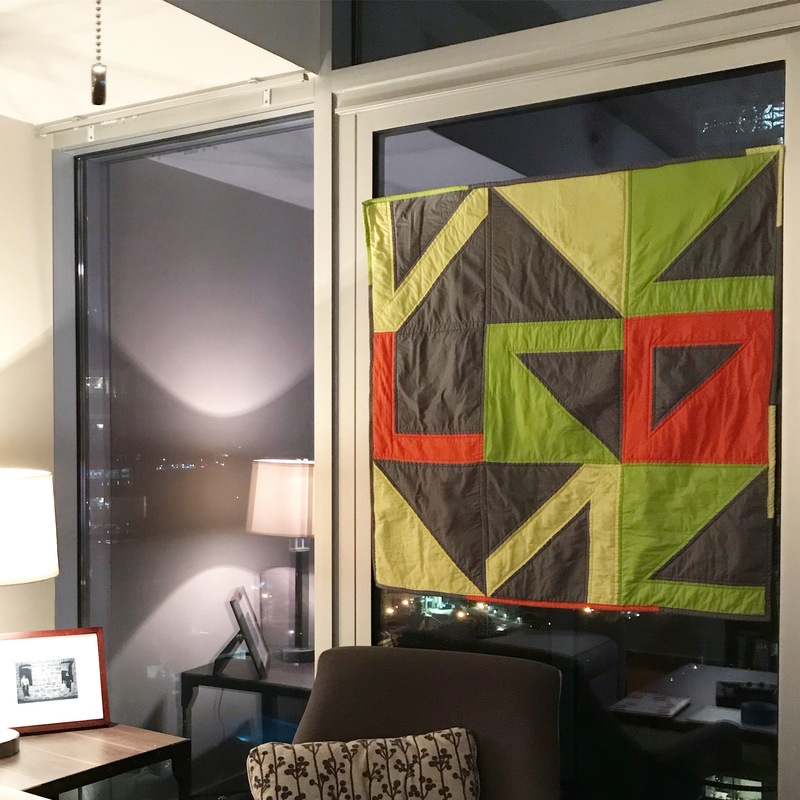 We wanted to honor our founding president, and decided to make—what else?—a quilt. We asked members to provide a signature block of their choosing in one of three block sizes. Additional requests were to use a light gray background and only solid fabrics. Beyond that, they were welcome to do any style of block they wanted. I volunteered to head up the project, including the task of piecing everything together. One member spied some modern letter blocks on a Pinterest board curated by the recipient and chose to make those up instead of a single block. Inspired by them and one block that came in with a darker background than all the others, I ended up making two ‘tops’ for a double-sided quilt. 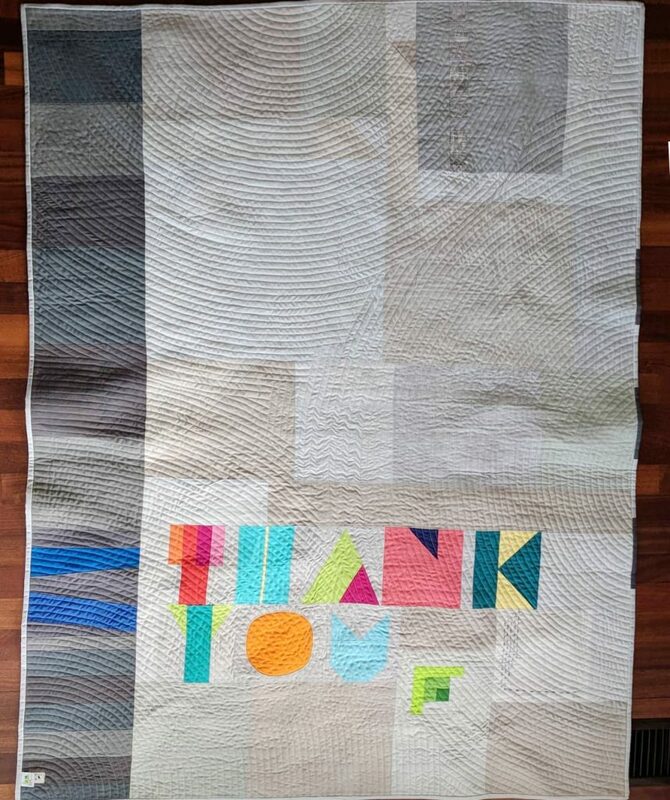 The Thank You side has a few other blocks submitted by members that fit especially well on that side, and the other collects the remaining blocks. The result was a quilt that channels both the guild and our president emeritus. We gifted her the quilt at our December meeting. I never did take any good photos, esp. since I finished hand-sewing the binding about 10 hours before our meeting (and slept most of the rest). Adherence to the block rules was mixed, but it all worked out in the end. If I were to run a similar collection in the future, I would change the requests based on what I learned. Here are a few guidelines that worked well or that I wish I’d implemented (hindsight and all that). Decide how exacting you need to be. If they don’t follow the rules, will you still use the blocks or will you refuse them? Provide a disclaimer about using/not using a block, cutting blocks apart, restructuring them, etc. Be very, very clear about block size. Give unfinished size for best results. If it matters to you, specify an ink color to use for signing. 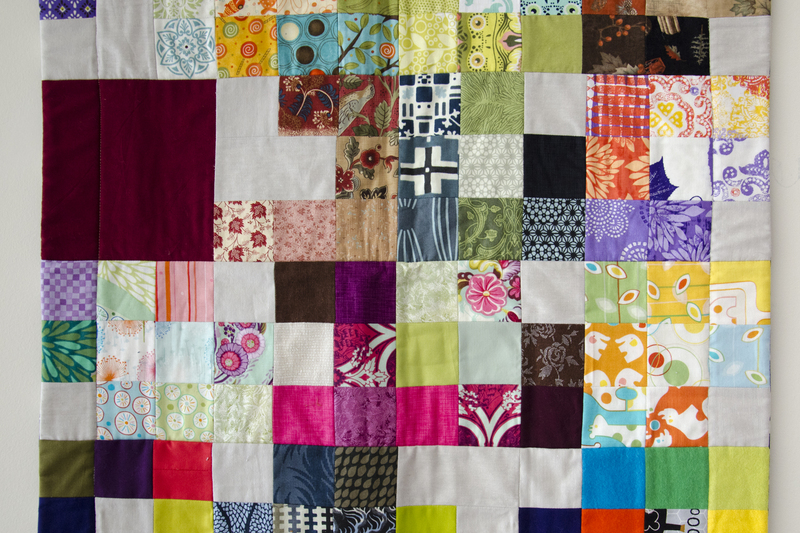 Be prepared to adjust your vision if you design the quilt before receiving all of the blocks. Set a deadline and be firm. Make sure to publicize the deadline clearly. If people donate materials to finish the quilt and you intend to return anything that is unused, keep track of who sends what. 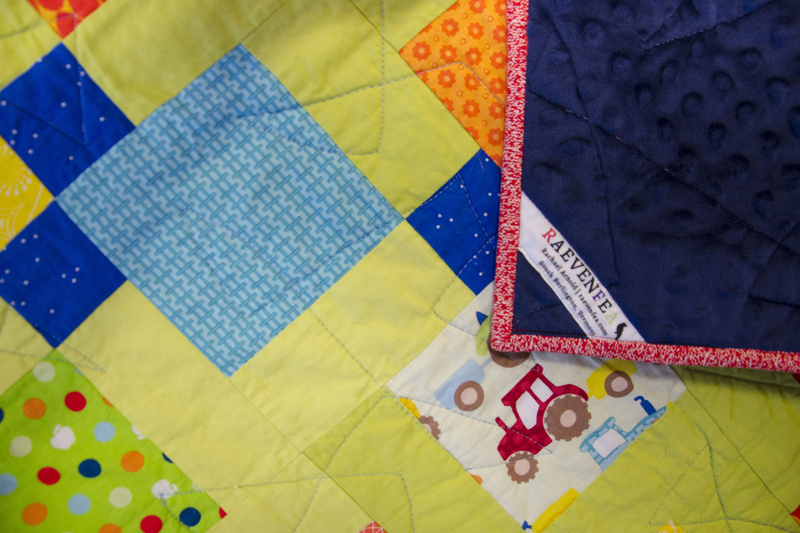 Or, consider passing on the rest to the quilt recipient if she is also a quilter. Provide a visual guide when specifying something like “light gray” or “channel Jane’s style”. Somehow, almost 50 members were able to keep this completely secret from the recipient, and she was completely surprised when we presented it at our December meeting. I call that a success! I finished this in late May 2017, but just got around to taking all the photos! In the fall of 2016, I shared progress on a long term project—a meta quilt, if you will—containing a block for each quilt I’ve finished. 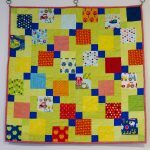 At the time, I still had a few blocks to make for older quilts, and have finished another four quilts in the months since. At my guild’s spring retreat in May, I took along scraps I’d pulled out for a few more blocks, and came home with the energy to finish up the final four. 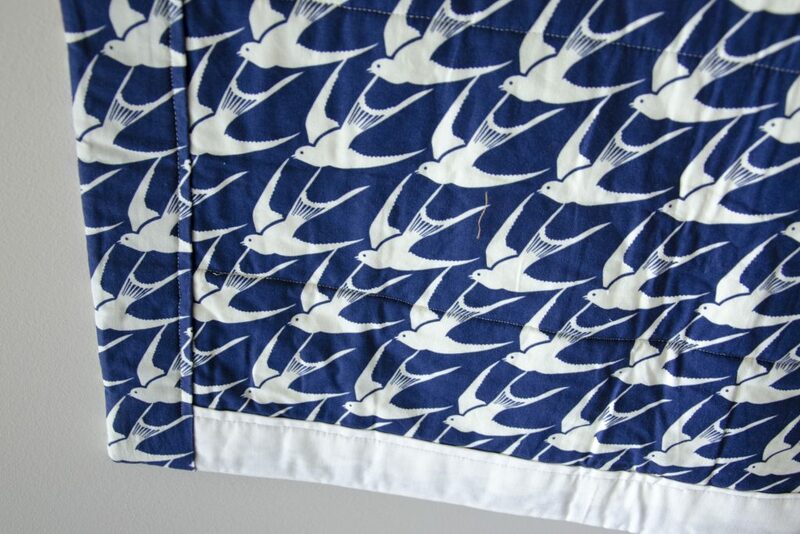 That energy extended to putting rows together (quilt-as-you-go style), then finishing the edges with a facing. It ran out right around the time I needed to take photos and blog about it, as seems the norm of late. 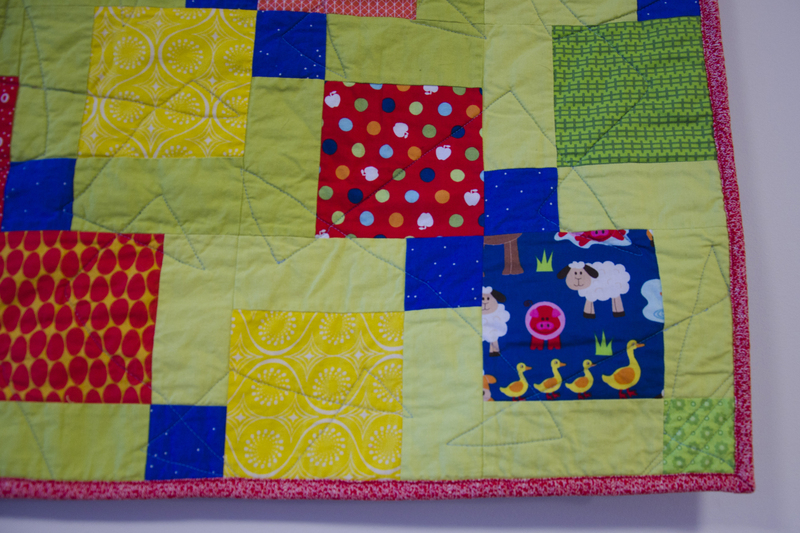 Each quilt has a nine patch dedicated to it. Each block has at least one square of Cloud9 Cirrus Ash as a cornerstone, and as many 2″ finished squares of the original fabric as I could scrounge up. Some quilts only had a few fabrics in them, and some I only had a few fabric scraps leftover, so extra space is filled in with the grey solid. 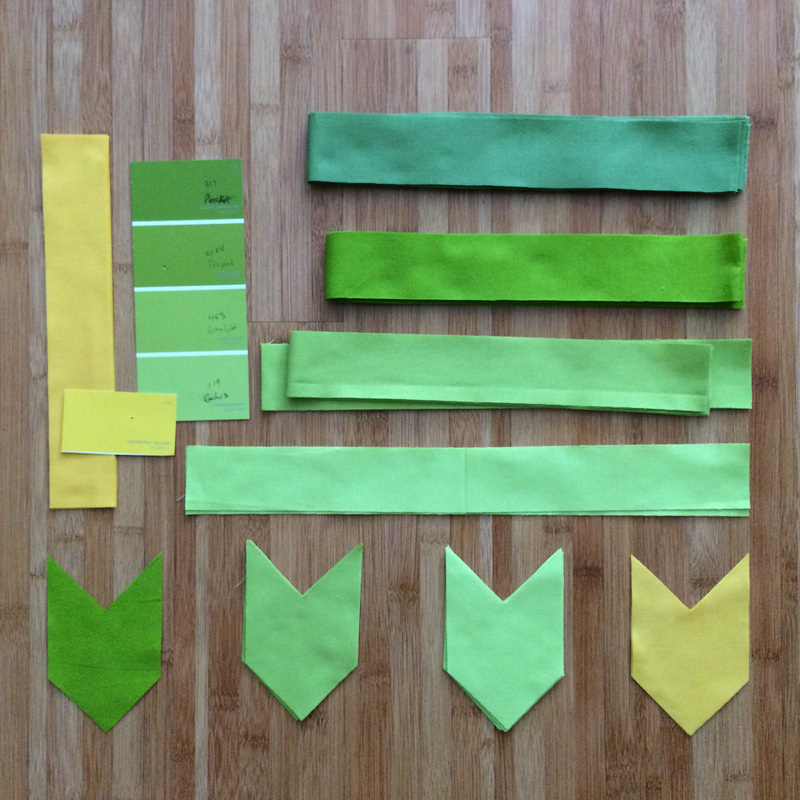 I had no scraps for a few quilts, so those are represented by a solid block of the right color (or, in one case, an approximation of a logo for my alma mater). Each block is rotated 90° along the row, which means my fussy cutting is sideways or upside down, but that’s okay. I found additional scraps after I’d already finished a few blocks and set them into the quilt, but decided to leave them be. They still capture the spirit of the quilts. 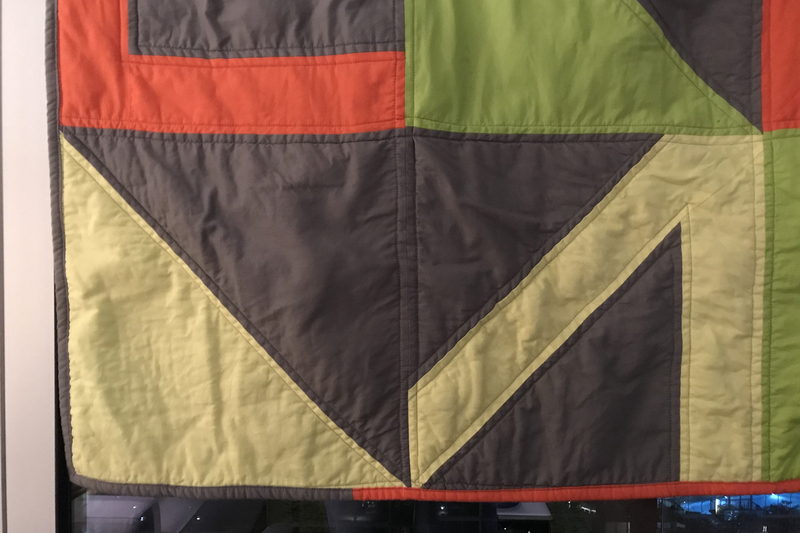 I put the rows together in a quilt-as-you-go method, so there’s no true quilting, except for a stitch in the ditch 2″ in from the edge that secured the facing to the back. Here it is, row-by-row, with links to posts about each quilt. All told, there are 48 blocks representing that many quilts from my very first in 2010 to a few baby quilts finished in early 2017. I completed my 49th quilt at the same retreat and completed another three throughout the rest of 2017, so there’s no slowing down yet! Maybe in another seven years or so, I’ll have another 48 blocks to finish a second panel. 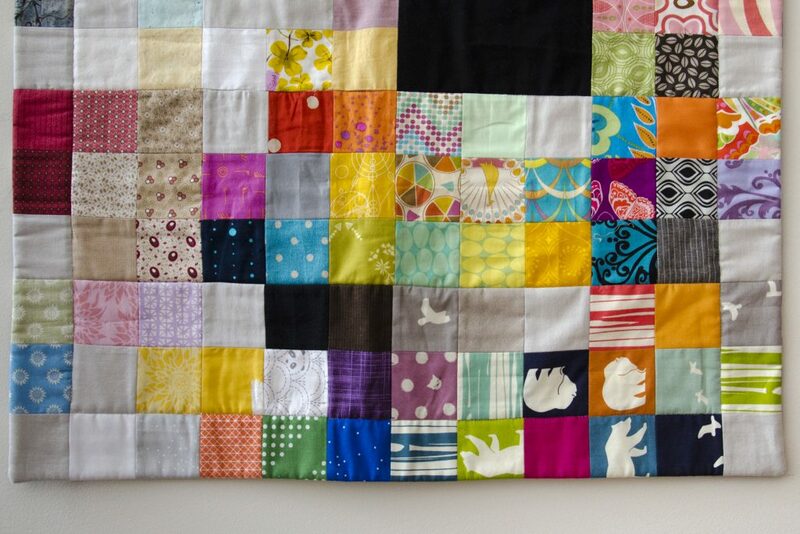 My goal is to keep making panels, then sew the panels together to form an ever-larger quilt. I may also eventually embroider years in the corner gray patch of the first quilt of the year, and add more info to a label on the back side. For now, I think this is going to hang in my studio if I can ever clean it up enough to have space for it. 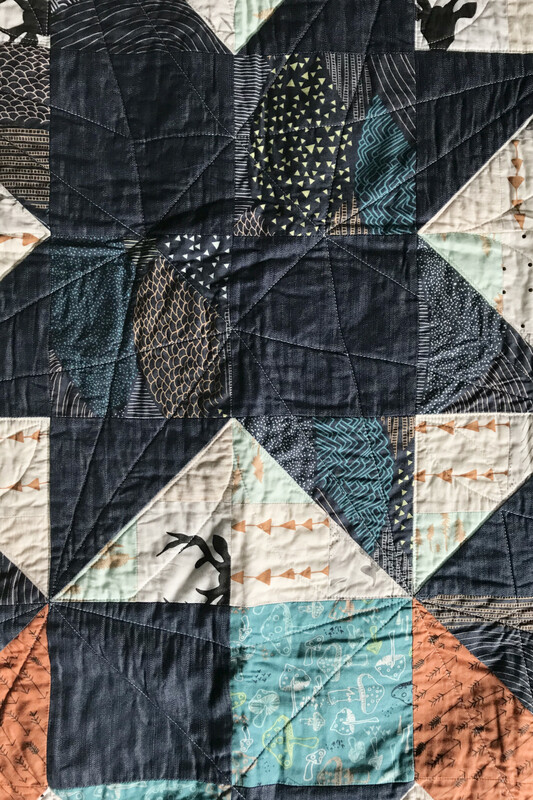 This is quilt three of four that I’m behind in blogging about from 2017, and was the 5th baby quilt of the year (of seven total quilts)! I threw it together quickly in October, trying to beat his birth. Then it sat around in my house waiting for me to remember to ship it, so was a few months late, just like this post. 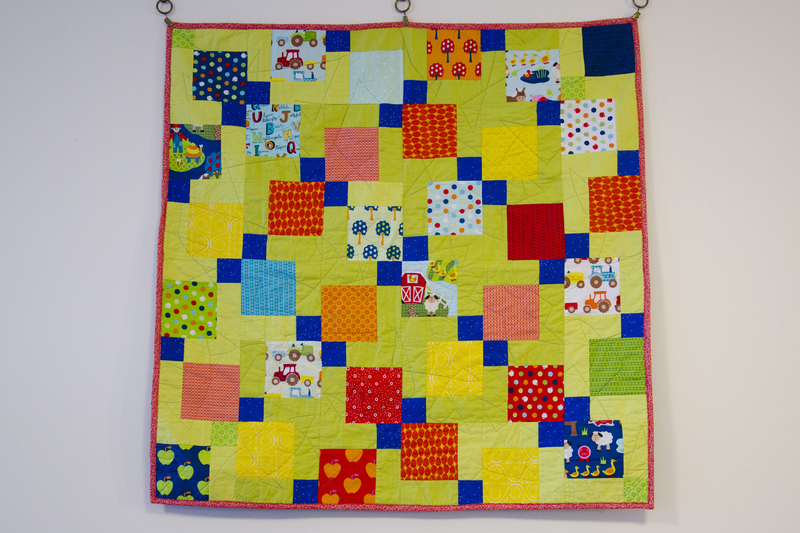 This has been the year of baby quilts, it seems. Or the year where only baby quilts were prioritized, perhaps. 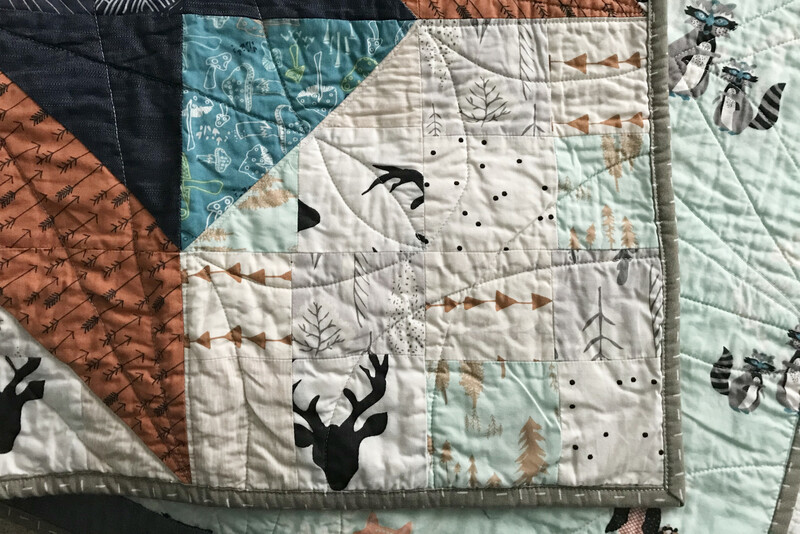 A baby boy is joining a family of three girls who have already received quilts marking their births (Impressions Baby Quilt, Noble Blooms, Jewelry Box), so after finding out, I quickly set out to make one for him, too. 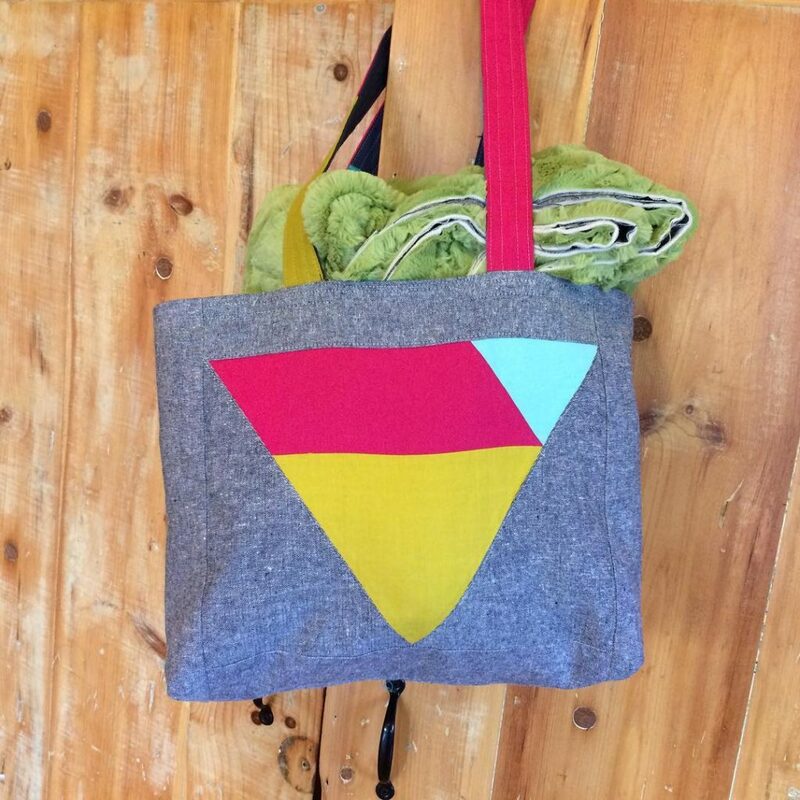 I dug into my stash for inspiration, and found a charm pack from the line Apple Hill Farm. It was a small pack though, containing only 23 charms. After wracking my brain for a good, quick design that goes well with 5-inch precut squares, I settled on a disappearing nine-patch layout that needed 36 patterned charms. I dug through my scrap bin and cannibalized a few coordinating charms from other packs, and ended up with enough. I paired the printed charms with two greens from stash (Kona Cactus and Limelight), and one last print—Cotton+Steel blue confetti dots—to tie everything together. I posted about disappearing nine-patch blocks a long while ago. 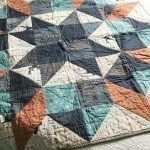 They make a great pattern that is simple to piece, since you start with large pieces and slice the nine-patch blocks apart to create the look of complex, smaller piecing. For this design, the four corners were patterned fabrics, the centers were blue dots, and the solid green filled out the middles. 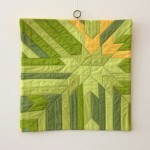 I mixed the greens on a couple of the nine-patch blocks to let me shift between the two colors within the quilt. 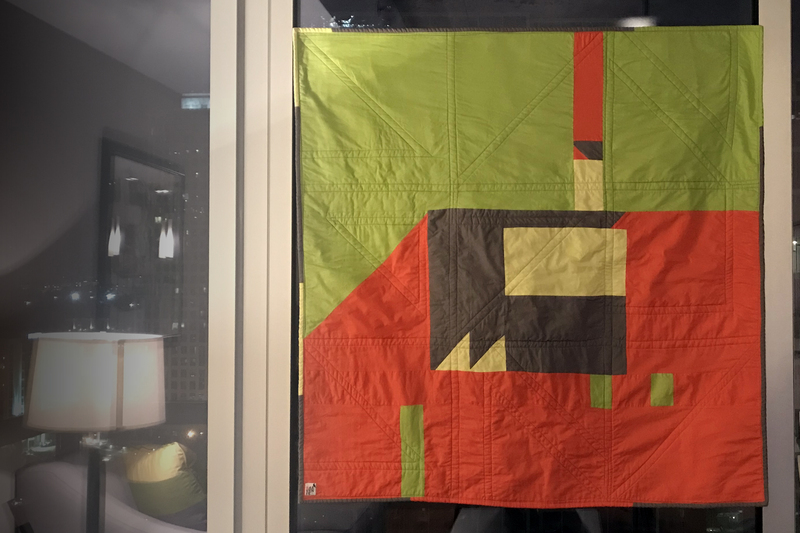 I didn’t have quite enough of either green to do the whole quilt, so I wanted to get a little creative with using the two. 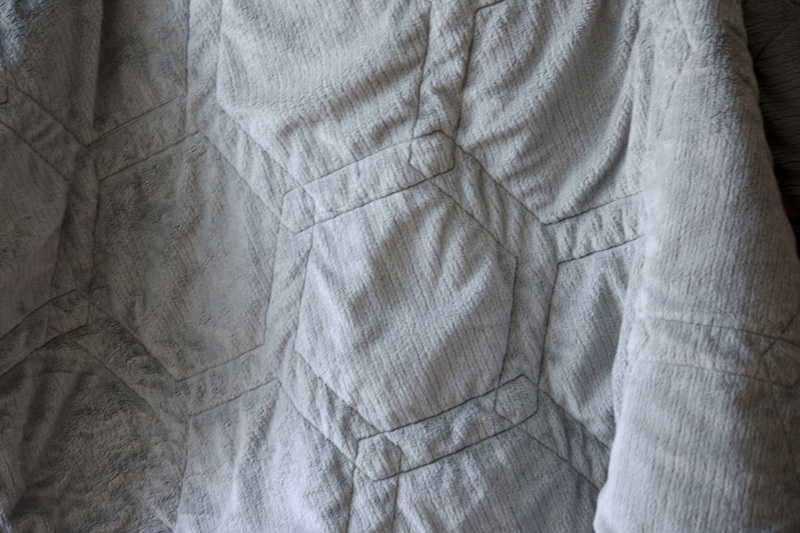 I quilted it with an all-over angular meander using a light blue 40wt Aurifil thread. 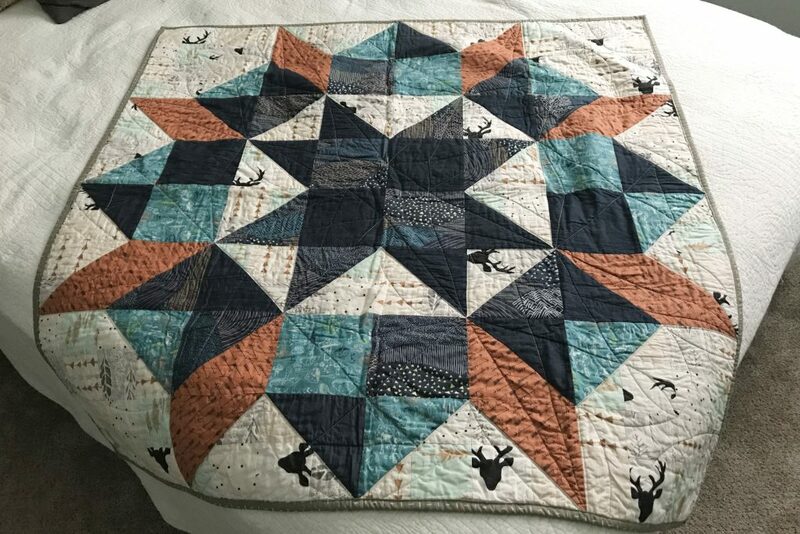 I don’t know if it was the thread, the unknown high-poly-content, low-loft batting (from the scrap drawer), or my machine, but this was a nightmare to quilt. I started out trying to free-motion quilt it, but after 4 broken needles, skipped stitches, and a few thread breaks, I switched to my walking foot. Jacquie Gering’s Walk (thanks for the b-day present, Mom!) talked about using reverse on sections of designs like this, and that was a brilliant tip. 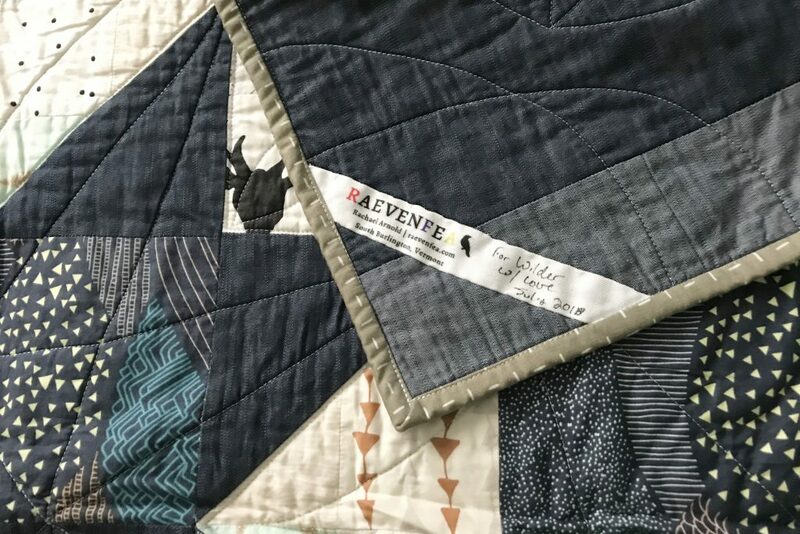 It’s backed with a navy dimple dot cuddle fabric and bound with a red print from a Sock Monkey collection that I’ve been hoarding since the early days of my quilting hobby. 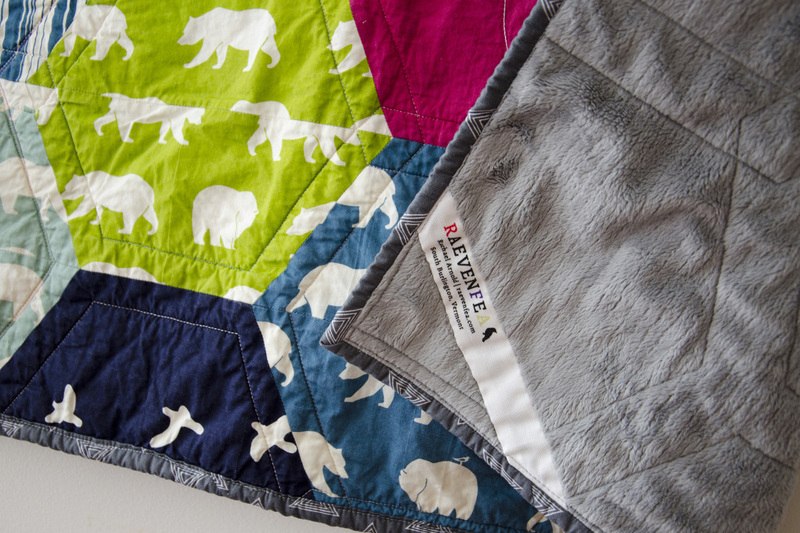 It comes in a bit smaller than the three quilts for his sisters, but it’s still a nice play mat size. Alas, the poor guy won’t be getting a hand-made stuffy any time soon like his sisters did. Maybe I’ll get my act together by his first birthday! It’s been some kind of a year. 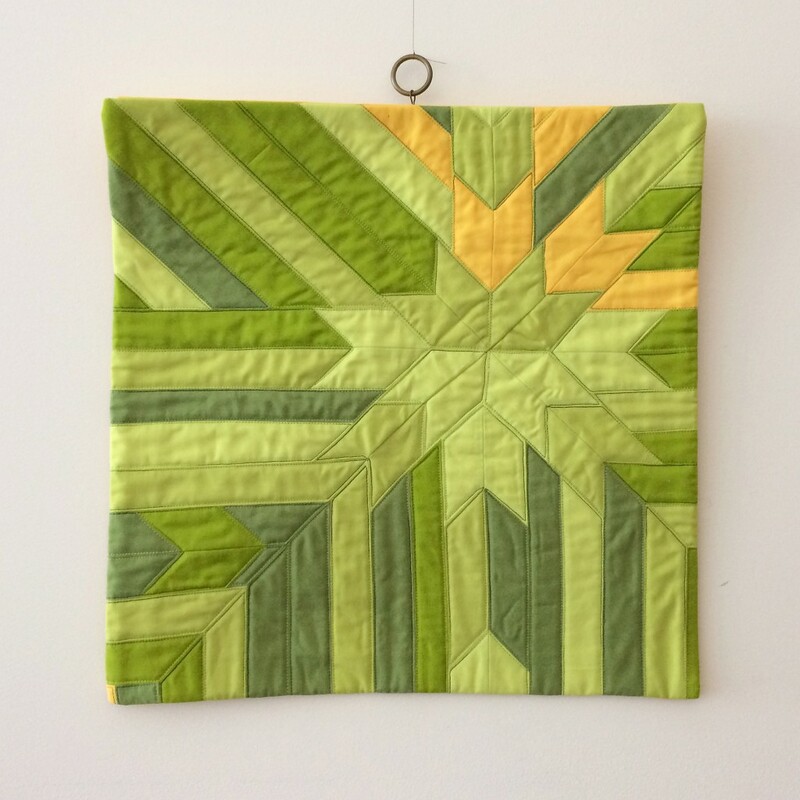 I have four quilts that I’ve finished but not blogged about, starting with this one that was finished back at a quilting retreat in May. I never did get around to getting more photos of it before giving it to my mother-in-law just prior to her starting chemotherapy in July. I’m hoping to catch up on posting the others between now and the end of the year. We’ll see! 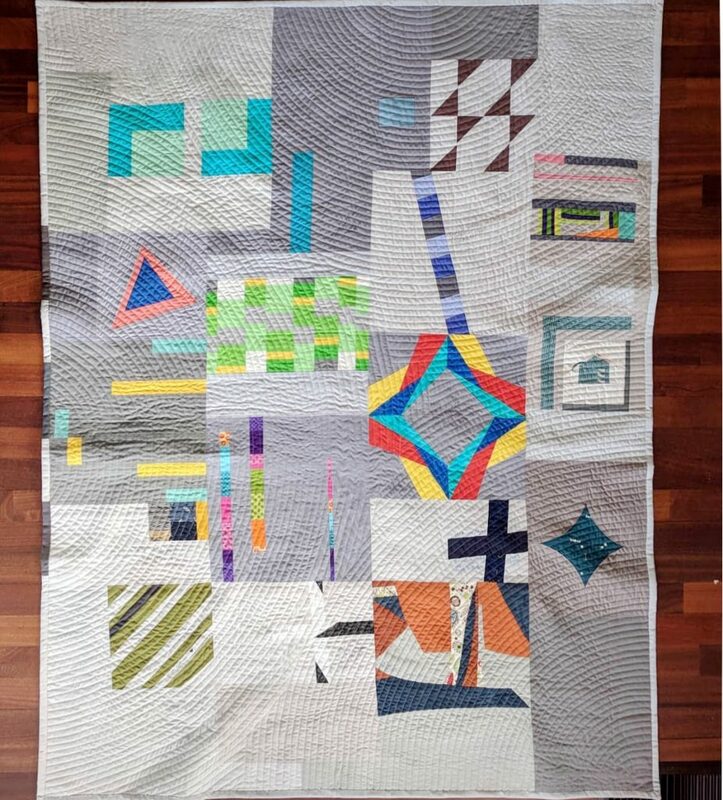 “Sampler on Point”, Rachael Arnold, May 2017, 46″x63″. 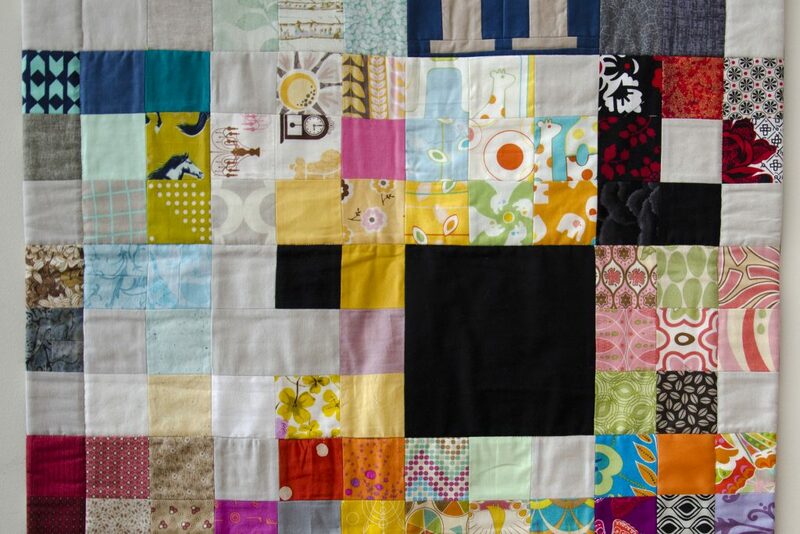 Once upon a time, I was involved with two different monthly sampler quilts at the same time. Then I moved halfway through the year and this one ended up with five finished blocks in a box, one unfinished block kit, and a no urge to piece them into a top. This one especially didn’t call to me—it’s really not my style at all, and no amount of sketching could change my apathy (to be blunt). But, I’ve been on a mission to clean out my old works in progress, and realized at the guild retreat last fall that I could go super simple with the layout, try a new technique (setting blocks on point), and end up with a reasonably-sized quilt with minimal effort. So, armed with six 12″ squares and three yards of a dark blue tonal fabric, I went to work. Setting blocks on-point isn’t that difficult, it just requires a few 4-letter words—one of which is math. 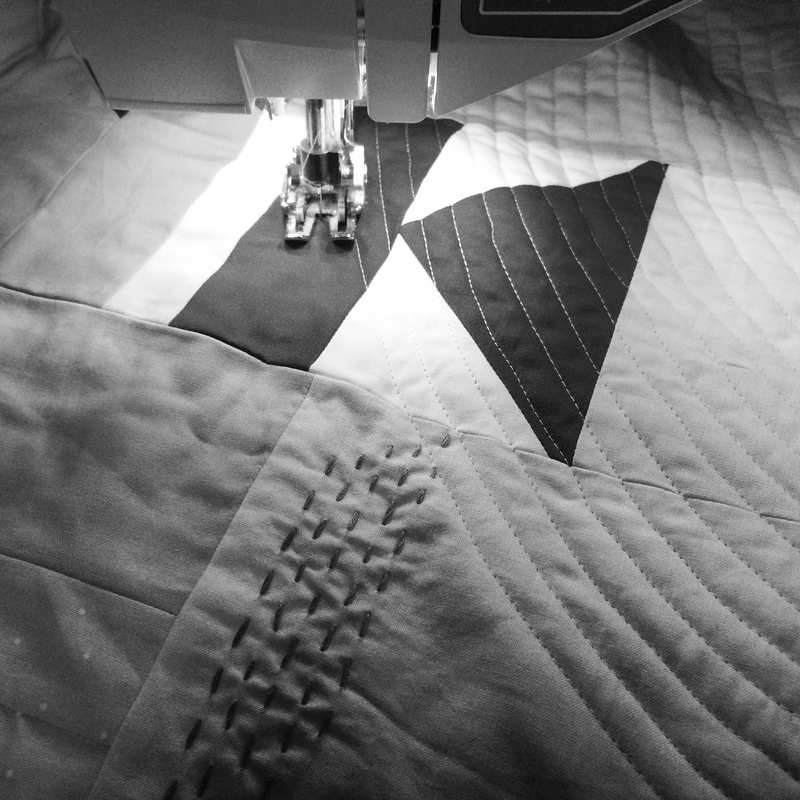 The most important number is the square root of 2 (√2, or 1.414), followed closely by remembering that you add 7/8″ to a square for triangle seam allowances (think half-square triangles). “Sampler on Point” (detail), Rachael Arnold, May 2017, 46″x63″. The other thing to consider is your fabric’s grain and bias. The reason we cut corner triangles as half square triangles, but side or setting triangles as quarter-square triangles is so that the outer edge is always on-grain, which makes those edges less likely to warp as we add borders or binding. (A secondary reason is to keep directional prints facing the right way.) A good tip when sewing your setting and corner triangles to your blocks is to always have the bias edge on the bottom, touching the feed dogs. That way the presser foot doesn’t stretch the bias edge (less of an issue for sewing machine brands with even feed feet or if piecing with a walking foot). That said, I broke the rules for a couple setting squares to conserve fabric (quarter-square triangles eat up fabric!) 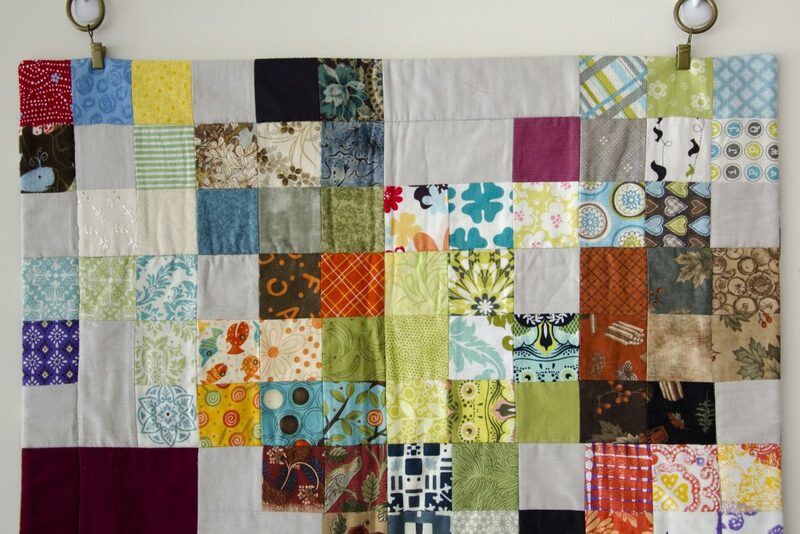 as I feel comfortable working with the bias while piecing borders and my fabric was non-directional. Do what works for you. I talked about four of the blocks back in 2013. The other two are “True Blue” and “The Windmill” (which actually contains five windmills). I added a 6″ border on all sides to bring the size up to 46″x63″. “Sampler on Point” (back), Rachael Arnold, May 2017, 46″x63″. While digging through my reproduction fabrics scrap box for other scraps, I realized I actually had yardage stored in the box! So, the backing of the quilt is made from the remaining blue tonal, a half yard of a Windham repro, and the rest of a dark red solid (also used for binding). I used Quilter’s Dream Wool batting because I had a package on hand and to see how I like it for possible future projects (I was not a fan of quilting it, but it does make for a nice quilt). 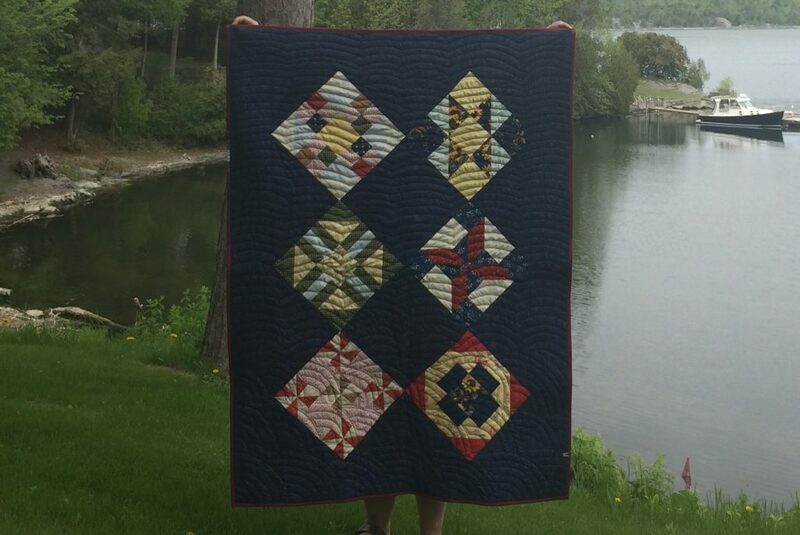 It’s quilted in a mix of a modified Baptist Fan pattern and echoed scallops using a navy Aurifil 50wt. While I liked how the fans looked, I honestly got really bored quilting them, so switched to the much faster scallops. It’s machine bound in a solid with a little scrap of piecing leftover from a block. I’m happy to have another old work in progress finished! 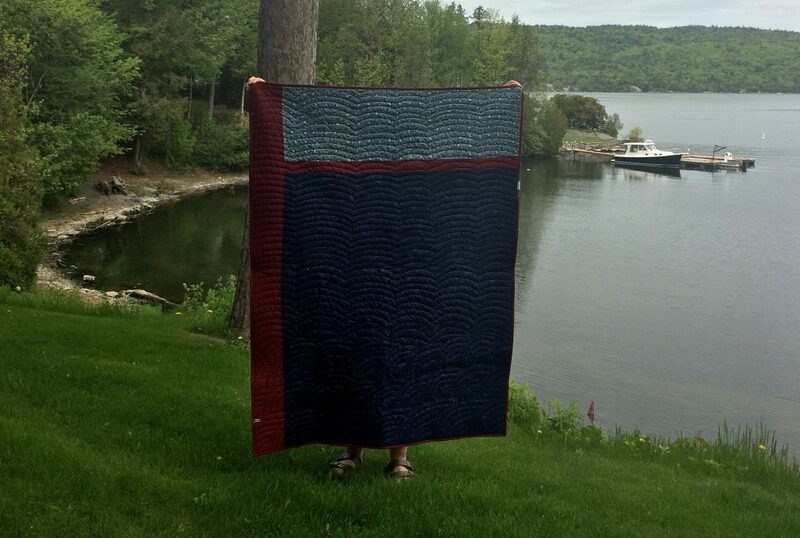 Special thanks to Trista for holding the quilt, and Basin Harbor Club for the awesome location. The view was much better than my photography skills. I’ve thought about making a hexagon quilt for years now. I even bought the Hex-n-More ruler two years ago to get started, but then couldn’t come up with the right project at the right time. 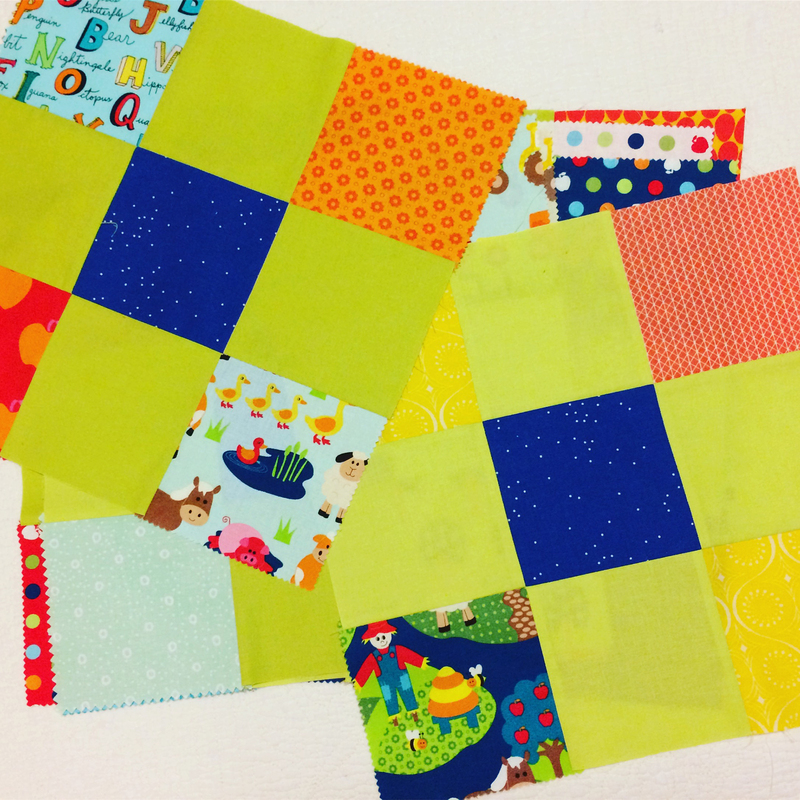 However, the arrival of our friends’ twin babies and a stack of fat quarters from Birch Fabric’s Bear Camp (plus a few other fabrics thrown in) gave me the perfect excuse to make two hexie quilts—although I settled on half hexies to take into account faster piecing (the babies came quite early!) and cutting layout efficiency. “Twice in Half #1”, Rachael Arnold, April 2017, 42”x54”. “Twice in Half #2”, Rachael Arnold, April 2017, 42”x54”. 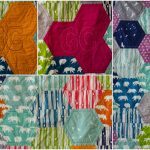 These 42″ x 54″ quilts use the 8″ half hexie size of the Hex-n-More ruler and were simple to piece row by row. I did a rough layout in Illustrator to try to spread the colors around somewhat evenly (also between the two quilts), although the final products are a little less random than planned—I didn’t do a good job of spreading around the prints, just the colors. “Twice in Half #2” (detail), Rachael Arnold, April 2017, 42”x54”. I mixed in a glittery gray, magenta shot cotton, and lavender Cotton+Steel polka cats into one quilt, then used the warmer red and orange Bear Camp prints paired with a solid orange (Cloud9?) in the other to make distinct, but similar, quilts for the brother and sister pair. 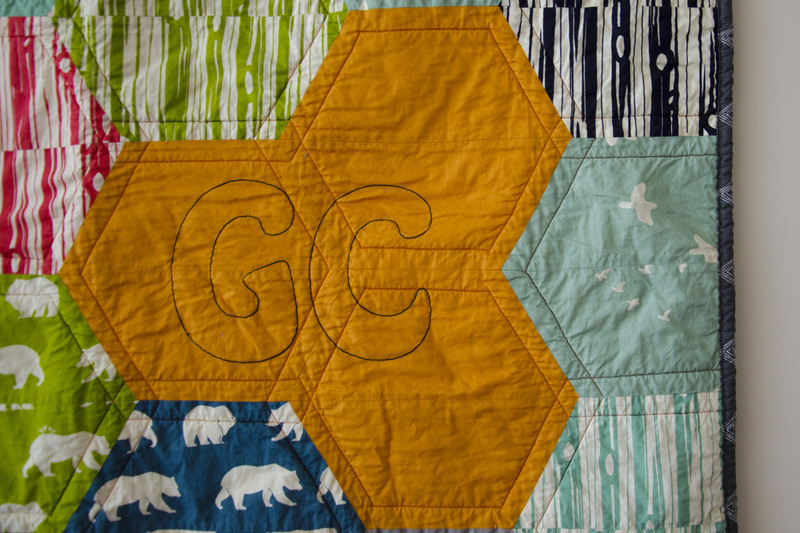 A cluster of three solid hexies was the perfect background for machine embroidering their initials on the quilt. I originally planned to do a three-letter monogram, but couldn’t figure out how to place letters for proper readability in the cluster, so went with just first and last initial in the center. “Twice in Half #1” (detail), Rachael Arnold, April 2017, 42”x54”. 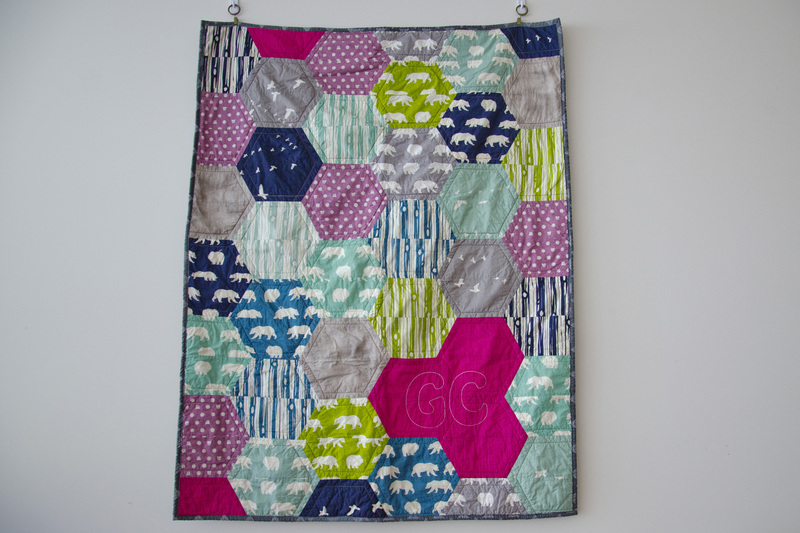 The quilts are both backed with a gray cuddle fabric, and quilted by echoing the hexie outlines. I used coordinating, but not precisely matching thread for the quilting, as it was already on my shelf in the right quantity. The magenta version was a nightmare—I tried three different threads and a variety of needles and still ended up with skipped stitches that I can’t figure out (other projects have gone fine in the mean time). I had to rip out so many lines of stitching. I ended up leaving in a few lines of magenta that had fewer skipped stitches (and sewed a line of pink next to them), because I was at my wits’ end with ripping. Warm & Plush batting is in between (a higher-loft version of Warm & Natural), to make for very cuddly quilts. 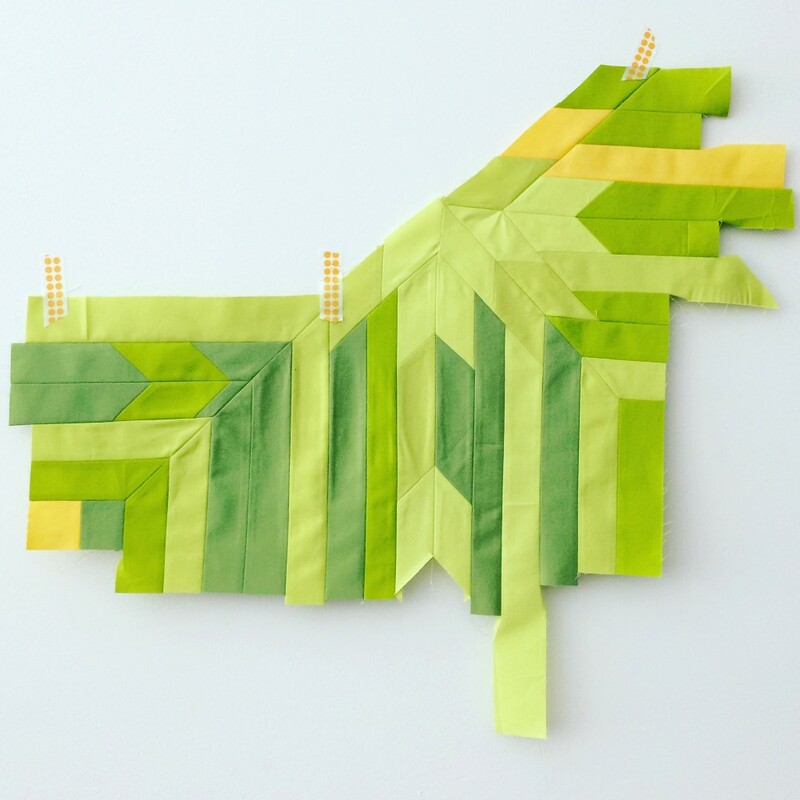 “Twice in Half” (back), Rachael Arnold, April 2017, 42”x54”. This is the first time I’ve ever used Birch Fabrics’ fabric. They’re an organic cotton provider, but none of my local shops carry them. 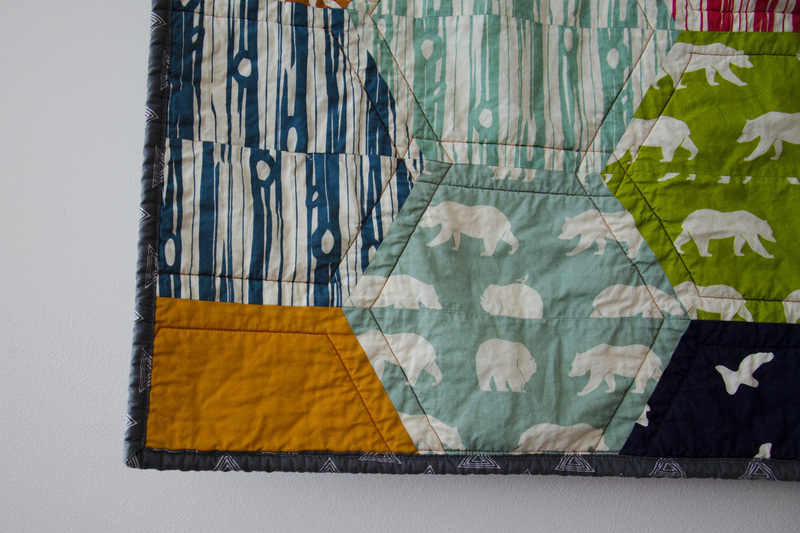 I grabbed the bundle from Massdrop (mixed feelings) late last year, knowing that I had a few baby quilts to make in the coming year. Overall, they’re a decent substrate to work with, but fair warning: they have very large (sometimes >1.5″!) selvages. They’re both finished off with a new label style I made. I dropped the QR code, and left room to one side to add a personal note. I took photos prior to writing in a quick note for each baby. I finished these up in April, but just recently had the chance to deliver them. Stay tuned for one more recent finish coming up shortly.